LiveCode Blog – Posts from the LiveCode development team and other community members. 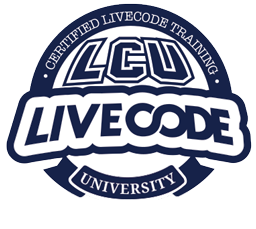 LiveCode Forums – Get your questions answered by other LiveCode developers. Online LiveCode User Guides – The official LiveCode documentation, online. LiveCode Wiki – A community effort to enlarge and improve the official LiveCode documentation. 1001 Things to do with LiveCode – See what people have created with LiveCode. The Flexible Learning Company – Producer of LiveCode add-ons and utilities. ChartMaker – A very nice LiveCode add-on library for creating charts and graphs. The Scripter's Scrapbook – A powerful script library utility. This web site was created by Devin Asay, who is responsible for its content and maintenance. Please send suggestions, comments, and error reports to devin_asay[at]byu[dot]edu. These course materials are used in the DigHT 210 and 310 courses at BYU. They are made available as a service to the LiveCode developer community free of charge. All materials here are Copyright © 2004, 2007, 2008 by Brigham Young University. Do not republish or reuse without written permission.